One of the rarest production in years after the Tolkien’s Lord of the Rings. The excess expedite of both politics and war are assembled quite extraordinarily in the mega TV Series Game of Thrones. This epic fantasy genre has won the praise of people because of its close connection with the historical medieval realm rather than just being from the make-believe theme. A TV Series that has witnessed immense popularity as the numbers of seasons increased. Eventually, new terrains as well as characters were introduced in this antique political drama, making the fashion industry possible to imitate some of the enchanted apparels that were showcased in GoT franchise. The outfits revealed in the popular spectacle range from coats, jackets, dresses, robes, and many more. Without any hesitation, it will not be wrong to say that the Game of Thrones has completely created its own wardrobe. Moreover, the epic franchise has taken the costumes to a whole new level, especially when you are living in cooler regions of the world. The whole series is based upon the expansion of territories which have enabled the ancestral details of costumes for each and every character that has been casted in the elite series. 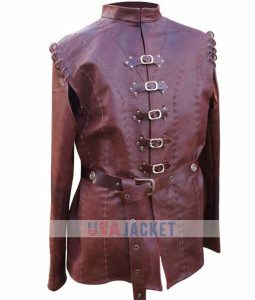 Here at USA Jacket we are enduring high-quality and durable fabrics in order to entail some of the specifics inculcated in the magnificent attires of Game of Thrones. Our team has to be on their greatest gauge ability in order to darn clothes with faultless fabrications. Now choose from embroidered masterworks incorporating the Jaime Lannister Jacket, Tyrion Lannister, Kit Harington, Arya Stark, Iwan Rheon Vest, and many others. The staff of UJ was much jubilated when they heard that they’ll be doing the Throne leather works. The GoT merchandise will be made exclusively for the elite fans. The historical fantasy catalogue has pushed us towards the edge of selecting first-rate cowhides. The materials right from their raw handpicks will definitely be going in the process of careful examination before sending them off for fabricates patterning process. In short, the team at USA Jacket will be working uncompromisingly to execute expressions completely out of this world. Stop waiting and give us a call or send a message via mail. 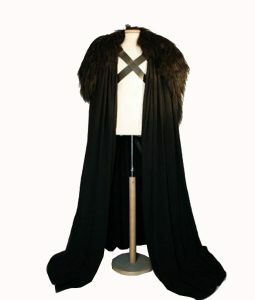 We are passionately waiting to make your Game of Thrones outfits scrupulously outclass.